MANILA, Philippines - Yep! iPhone 6s and iPhone 6s Plus are already available through the country's leading mobile services providers Globe Telecom and Smart Communications Inc. (Smart) starting November 6, 2015. NEW IPHONES arrive at Smart and Globe. Smart and Globe announced it will offer iPhone 6s and iPhone 6s Plus dubbed as 'the most advanced iPhones ever' a week before the official availability of Apple's latest flagship devices in the Philippines. 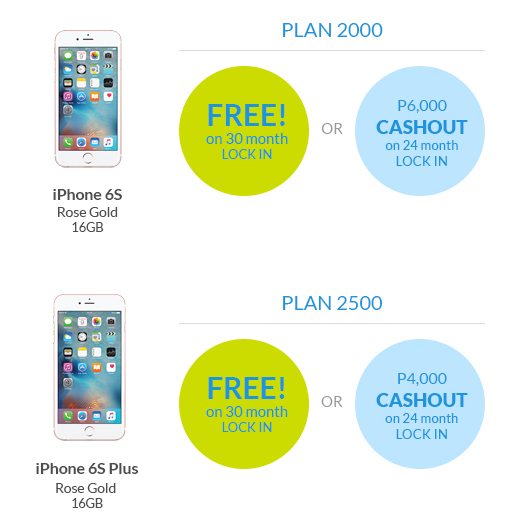 Check out Smart and Globe latest postpaid plan offers for iPhone 6s and iPhone 6s Plus. On Friday, Smart said that iPhone 6s 16GB will be FREE on Plan 2000 for 30 months, while iPhone 6s Plus 16GB will be FREE on Plan 2499 for 30 months. Customer may also choose Plan 2000 and Plan 2500 for 24 months lock-in period but with P 6,000 and P3,000 cashout respectively. Smart Infinity, Smart’s premium postpaid brand will also offer iPhone 6s 128GB under Infinity Consumable Plan 5000 or two units of iPhone 6S 16GB under Consumable LTE Plan 8000.
iPhone 6s on Plan 2000 comes with a super-sized 10GB data allowance every month for videos, music and games; plus All-Month Surf, for unhampered access to websites and apps like Instagram, Facebook and Twitter, and chat apps like Viber, Whatsapp, Line and Messenger, among many others, throughout the 30-month period. On the other hand, iPhone 6s Plus on Plan 2499 is inclusive of a super-sized 15GB data allowance every month and All-Month Surf throughout the duration of the contract. 2. Get 20% discount from Zalora. Experience the high life with as much as 20 percent discount for a minimum purchase of P500 from leading online fashion store Zalora. 3. Enjoy P2500 Airbnb discount. Enjoy P2,500 discount on your Airbnb booking with a minimum spend of P8,000 at any listing in over 190 countries around the world. 4. Get iflix access. Get three months’ worth of iflix access plus 1GB of data for streaming your favorite movies and TV shows. 5. Win a new gadget instantly. With Smart’s Share the Joy Gadget giveaway promo, you can get a chance to take home another brand new gadget instantly when you sign up for a Smart Postpaid Plan or recontract at Smart stores nationwide. 6. FREE Gadget Shield. Get FREE 30-day insurance for your new iPhone with Smart’s Gadget Shield. 7. Upgrade with Smart’s Wipeout promo. Wipe out your existing contract to upgrade to the new iPhones and enjoy corresponding discounts depending on the number of your remaining months in your contract. 8. Purchase from Apple Music, App Store and iTunes even without a credit card. Smart is the only mobile network that lets you enjoy the full range of digital content from the Apple Store, iTunes and Apple Music even without a credit card through the groundbreaking Smart Pay-With-Mobile service. Simply text REG to 4949 so you can start buying apps and charging in-app items on top of your postpaid bill or deducted from your prepaid load – a first in the country. For complete details on pricing, please visit smart.com.ph/iphone. Globe was the first to announce the availability of new iPhones last October 26. With 24 months lock-in period, the iPhone 6s 16GB will be available on Plan 1799 with Php450 monthly cash-out while iPhone 6s Plus will also be available on Plan 1799 with Php650 monthly cash-out. 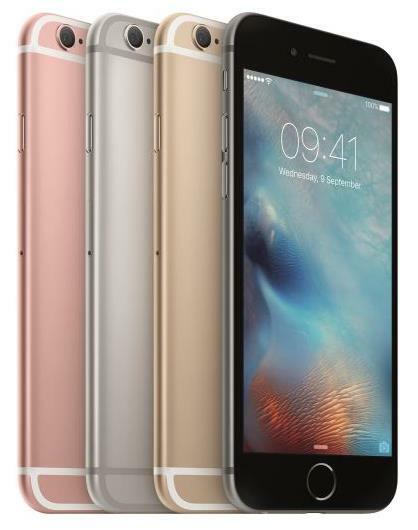 Customers can pre-register for the iPhone 6s and iPhone 6s Plus on their website www.globe.com.ph/iPhone6s. iPhone 6s and iPhone 6s Plus bring a powerful new dimension to iPhone’s revolutionary Multi-Touch interface with 3D Touch, which senses force to enable intuitive new ways to access features and interact with content. The new iPhones introduce a transformative new approach to photography called Live Photos, bringing still images to life by capturing a moment in motion. Live Photos, 3D Touch, 12-megapixel iSight camera, 5-megapixel FaceTime HD camera with Retina Flash and more are powered by the Apple-designed A9 chip, the most advanced chip ever in a smartphone, delivering faster performance and great battery life. New gadgets are designed with Retina HD displays made from the strongest glass on any smartphone and 7000 series aluminum, the same alloy used in the aerospace industry, in gorgeous metallic finishes that now include rose gold.